I guess it can be said that I went to Atlanta to eat because I probably ate at a record number of places in my 3 days there. I didn't realize how many amazing restaurants the city had until I started researching (and drooling). I was obviously expecting to eat tons of delicious Southern food, but I was surprised at how much Asian or Asian fusion food there was. If you want to visit a city with a variety of high quality foods, I would strongly recommend Atlanta because you can eat yourself into a food coma everyday! If you want to see what I did in Atlanta besides eating, check out my Best of Atlanta blog post here. Thai fusion food with a Southern twist. That's how I would describe the mouthwatering Poor Calvin's. We luckily made a reservation because within 10 minutes of the restaurant opening, there was a line out the door of customers wanting table. I took that as a sign that the food is good! And I definitely was not disappointed. The portions are HUGE. I ordered the fried chicken with a sweet potato waffle and was shocked at how much food came out. It wasn't New York portion size for sure! I had heard amazing things about Mary Mac's from online reviews and recommendations from friends so I was really looking forward to trying the Southern food here. Unfortunately, the wait on a Saturday night was way too long for me (and I was starving) so I got my dinner to go to eat at home. Maybe this impacted the taste because I felt that the food was no more special than any other Southern restaurant I had previously eaten at. The fried chicken was well seasoned and crispy and the mac and cheese was perfectly baked and not swimming in excessive cheese. Was I happy over the outcome of the food? Yes. However, was I happy that I didn't waste my time waiting for a table for the food? Yes. My biggest tip for eating here is to either come early, come on a weekday, or just order takeout. SO DELICIOUS. Jeni's was the dessert I was most excited for in Atlanta and it definitely didn't disappoint. For a popular ice cream shop, the prices were also very reasonable. I was able to get 3 scoops of ice cream for only $6- in New York this probably would have cost $9. The flavors were so unique, although they did have the typical cookies and creme and vanilla. I went with the pistachio honey, gooey ooey cake, and maple brown sugar brittle (best flavor). The Jeni's branch I went to was located inside an awesome little market, Krog Street Market. This market is actually connected to its sister market, Ponce City Market, by way of the Bridge Line. So you can work off those ice cream calories! I arrived in Atlanta around midnight Friday night and didn't want to waste a second in getting started in my Atlanta adventures so I dragged my friend to get late night dessert at Sublime (which is open 24 hours). I spent so long trying to decide which donut to get that I'm pretty sure the guy behind the cash register lost his patience and just started telling me that everything is good (tbh it probably is). I ended up going with the butterscotch toffee and caramel donut because I love both toffee and caramel so I knew the combination would be mindblowing. By this time of the day, my friend and I were both stuffed from the food we had been eating throughout the day so we initially wanted to skip Cypress Street and just head home to bed. But since it was my last night in Atlanta, we decided to spend some more time together and instead headed to the bar for some snacks. I originally wanted to eat their famous donut burger, but since I wasn't too hungry, my friend and I shared this giant plate of chicken nachos which were delicious. I wish I had been in the mood for a drink because the list of beers they had available was so extensive! I wanted my last meal in Atlanta before heading to the airport to be mainly convenient because I wanted to be at the airport early. (airports definitely stress me out). Takorea was located near the subway station that would take me directly to Hartfield International Airport and was a Korean Mexican fusion restaurant so I figured it would be a good lunch spot. Having gone to college in Austin (king of fusion food basically), I'm no stranger to Korean Mexican food. 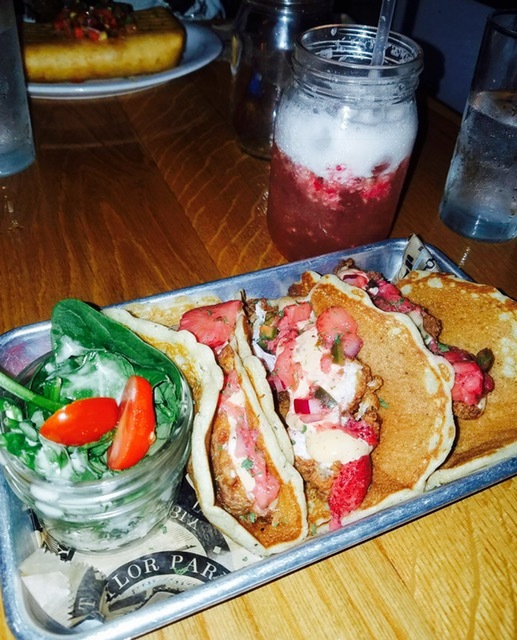 Takorea is reasonably priced (but what in Atlanta isn't) and has a menu which specializes in tacos. Takorea wasn't as inventive as some of the other fusion restaurants I've tried in Austin, but those spicy fries were still yummy! Sweet Auburn was actually opened by an older alum from my sorority's Alpha Chapter so I knew I wanted to try it out while I was in Atlanta. Although in my opinion no barbecue can compare to the offerings in Texas, Sweet Auburn was pretty good. I ordered the bbq plate, which came with two sides, and the amount of food (especially fries) that came was just too much for my stomach. BUT I still ate everything! I loved the tenderness of the brisket and the cheesiness of the mac and cheese, and most of all, the seasoning of the fries. There isn't a Chinatown or Koreatown in downtown Atlanta (or in its immediate vicinity for that matter) so it was hard for me find a good bubble tea place but I wanted to have a drink anyways. After all, what is a vacation without bubble tea? My friend recommended Sweet Hut to me saying that it was also an Asian bakery as well. And who am I to say no to bread? If you're looking to hang out or even study in Atlanta, this is the place! The interior is quite large and beautifully decorated and the drinks, while a tad too sweet, are still a good choice. Ever since I read my favorite blogger, Cest Christine's post about having her casual wedding reception at Tiny's, I've been wanting to eat inside the adorable pink facade. So I was ecstatic when my friend asked me to brunch here on Sunday. I'm not sure if its actually the city's tiniest bar, but its definitely the cutest! We brunched by the upstairs window and it was the perfect start to my day. The food was AMAZING. I had my doubts at first because bars aren't normally known for their extraordinary food, but Tiny's is clearly an exception. Note- While we did go during Restaurant Week, we did not eat off their Restaurant Week menu because we didn't feel like we needed 3 courses at 11am. We started out with two giant scones that came with butter and jam and that's honestly when I knew it was going to be a good meal. The scones were well baked and matched well with both the butter and the jam. My loaded egg sandwich entree came with cheese, scrambled eggs, and avocado as well as the most delicious tater tots ever. They might be the biggest too! The tater tots were actually loaded with cheese and chives. I loved it! Tiny's was beyond delicious and I can't wait to return for the dulce de leche waffles or their kale salad! For those of you who have gone your whole lives without eating hot pot, you are seriously missing out! Hot pot is a Chinese soup/broth cooked live on a little stove in front of you and filled with a variety of vegetables, meat, and dumplings, noodles, seafood, and other Asian tidbits like fish balls. It's typically eaten with dipping sauce to add to the flavor. Most Asian families (including mine) make hot pot a huge event where family members gather around one giant pot in the middle of the table and take turns putting different ingredients into the pot. Nowadays there are fancy hot pot restaurants where individuals get their own pot (for apparent sanitary reasons). I recently tried a hot pot buffet (unlimited ingredients) at Spring Shabu in Flushing, Queens. Although I've eaten at the two popular Manhattan hot pot buffets- 99 Favor and Hometown Hot Pot- I really wanted to try something different and cut down on my wait time. Usually the wait at Manhattan hot pot restaurants is over 2 hours due to the popularity and value of these places. At both of the hot pot buffets I had previously eaten at, customers usually still order off a menu and dishes are brought out one by one by a waiter. In other words, its not a typically buffet where you get up and get your own food from serving lines. These restaurants do this to limit waste and uneaten food. 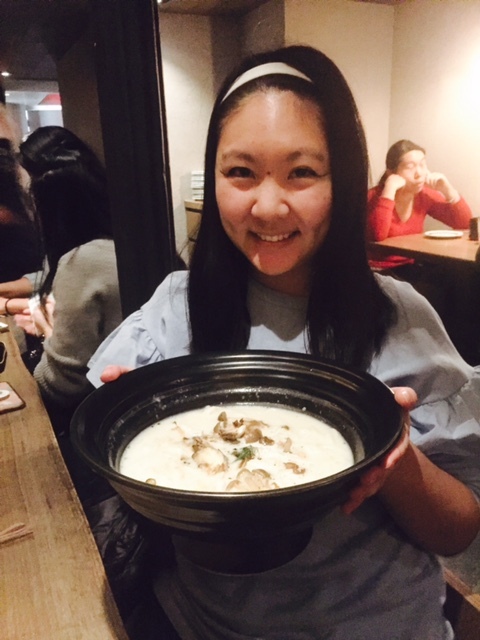 However, Spring Shabu allows its customers to get their own food and provides 5 rows filled with hot pot ingredients. There is seriously something so gratifying about seeing rows and rows of food right in front of you- all for the taking. It was completely overwhelming! Even the sauce bar was on a different level. As you'll see below, there were 4 rows of different sauces. I saw some of my favorites- hoisen, sesame, chili oil, peanut sauce, as well as some sauces that I had never seen at a hot pot buffet before- honey mustard, scallion paste. For $17, you can eat until your stomach is filled to the brim. Even There's even unlimited green tea and vanilla soft serve ready for dessert! The main difference with Spring Shabu is that meat and seafood is not included in the buffet price of $17. It is ordered separately at an additional price, which is probably why the overall cost is much lower than Manhattan hot pot buffets that usually charge around $23. We ordered 1 plate of beef for $4 because what is hot pot without any meat! Our original plan was to order more if needed, but we were so excited on seeing the giant buffet of food that we ended up getting full and not needing anymore meat. Even though I feel like Flushing has more legitimate Chinese food, I'm always hesitant to make the trek out there just because the train ride is SO long and I hate having to switch trains in the middle. But Spring Shabu has changed my mind! The quality and quantity (they've proved its possible to have both!) of the buffet at Spring is something that I definitely can't get anywhere in the city. Its a buffet that's truly on a different level. New York Restaurant Week is held twice a year and its an awesome opportunity to try some of the best restaurants in the city for a fraction of the best. Even though the menus are special and sometimes doesn't include the restaurants' greatest dishes, the quality of food and the restaurant ambience is still there. In my opinion, Winter Restaurant Week options are always better than the summer options (maybe because when its freezing outside there's nothing else to do but eat?) so I usually participate around this time. Lunch is priced at $29 for 3 courses and dinner at $42. This year my friend and I reserved a table for weekday lunch at the NoMad steakhouse, Maxwell's Chophouse, near our offices. The steakhouse didn't have really good reviews on Yelp, but I had heard good things about their service and the Restaurant Week menu looked delicious so I decided to give it a try. It turned out to be amazing!!! The food was so delicious that I seriously considered coming back, although the $62 full price of a steak may be a little out of my budget. As expected the service was impeccable- our coats were whisked away for complimentary coat check, our leftover food was quietly packed up for us and held at the host stand for when we were ready to leave, and our waiter was so attentive it felt like private dining. I ordered the New York strip steak and my friend ordered the Atlantic salmon and our food came with a basket of free bread! My steak was seasoned perfectly and not overdone (I don't like the taste of burnt meat) or underdone (I also find the taste and look of bloody meat to be highly unappealing). The tuna tartare cannoli was an interesting concept as I had never seen tartare presented in tiny cannoli before. The combination of the tuna with the avocado dressing was beautiful. I loved it! The portions were surprisingly big- I was expecting tiny portions since it was fine dining and New York after all- but all of our courses were decently sized to the point that I actually had to take a lot of the food home to eat later #smallstomachproblems. I highly encourage you all to try out Restaurant Week in whatever city you live in because it is such a good deal! I definitely ate more than $29 worth of food and it gave me an opportunity to try out a restaurant that I otherwise would have not probably had the chance to. If you live in New York, there is still one more week of the Winter Restaurant Week and you can check out the participating restaurants here. I"m so grateful for my friend, Amanda, who brunched with me this past Monday after the cancellation of my Canada trip. I was left with a 3 day weekend of no plans (and I always have plans) so I spent Monday morning doing one of my favorite pastimes- brunch! Amanda recently got engaged (!!!) and we had a lovely time discussing her wedding planning and just general catching up. 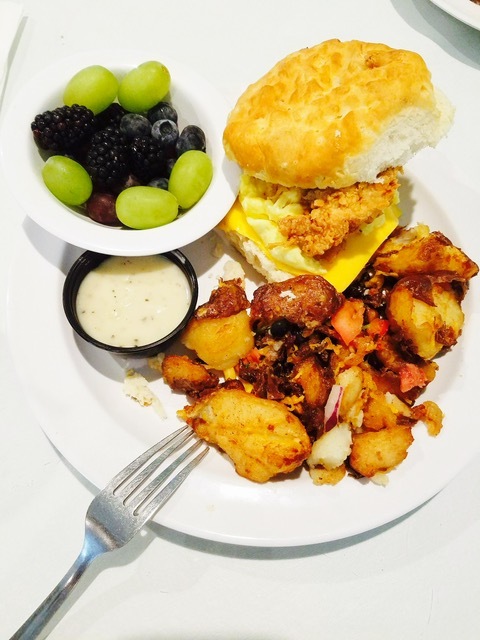 Since it wasn't the weekend, many brunch spots were only open for dinner or served their breakfast/lunch menus instead of their brunch menus so a lot of the places I originally wanted to try weren't options. After scouring through my Yelp Bookmarks (yes I'm a proud Bookmarker) and looking at opening times and reviews, I chose the West Village restaurant Oscar's Place. From the outside and the interior, the restaurant, although tiny and cute, looked very average so I honestly wasn't expecting too much. However, first the prices were unbeatable. Most of the food options were under $15 and the menu was so extensive it took up two entire pages (not including the drinks which was located on a third page). Then, I discovered that the food at Oscar's Place was surprisingly delicious. Amanda and I decided to split entrees so we could try one savory dish and one sweet one. This turned out to be a great decision because the french toast would have been way too sweet if I had eaten the whole thing in one sitting. Instead, I was also able to sample her croque tuna and fries. You can see from the pictures below that the portions are pretty big. I loved how my iced latte came in giant soda glass instead of one of those tall skinny glasses most places use! Beware though, the restaurant is extremely tiny even by New York standards! The tables are packed in there to the very last inch so its probably not a great place for groups. Luckily we went on a weekday so there weren't too many other customers eating, but had all the tables been filled, I think the restaurant would have been slightly too overcrowded and claustrophobic. I guess its a small price to pay though for delicious food! That's why Oscar's Place has earned 5 toasts on my scale. I want to first preface this review by saying that I am 100% not a vegetarian and to be honest I barely even like eating vegetables. Most days I can't imagine having meals with no meat! I heard about the famed vegetarian/vegan restaurant, The Butcher's Daughter, from a friend who raved about her brunch experience there. She kept saying the food was delicious and that the decor was so cute. I'm always a sucker for cute things so when two of my friends came into town for a visit (and with one of them being a vegetarian) I decided to take them to The Butcher's Daughter for a meal. I wasn't expecting too much out of the food because I've had a bad experience with vegan food at another restaurant before. The Butcher's Daughter doesn't accept reservations so we made our way to the West Village location (there is the original spot in Lower East) around 6:30pm for an early-ish dinner. Luckily, there were many open tables and we didn't have to wait at all. As expected, the inner decor was adorable and I bet it would have looked even better in the daytime with natural sunshine. There was loud-ish club music playing when we were there for dinner, which didn't match the vibe of the place so I'm not sure what was going on with that. Nevertheless, we loved the multitude of plants everywhere. My friends and I chose to order 4 dishes and split everything so we would be able to sample more items of the menu, which also as expected had not one dish with meat on it. We got the roasted potatoes, spinach and vegan cheese quesadilla, spaghetti squash pesto pasta, and the spinach and artichoke dip. Here comes the big shocker- everything was AMAZING. I was so surprised! I couldn't believe that everything was made with only vegetables because I couldn't taste any vegetable at all! It all tasted so delicious and real (I always feel like the problem with vegan food sometimes is that it tastes fake). The quesadilla was my favorite because it was the most flavorful as it also had mushrooms and pico in it. The spinach and artichoke dip wasn't as heavy as it normally would be so I didn't feel guilty dipping my baguette in for the largest scoop. The potatoes were a good staple side dish and came with some sort of mayo sauce on the side that I was just obsessed with. The biggest surprise of the night was definitely the pesto pasta. I thought the taste would be all screwed up since it wouldn't have any noodles, but the pesto flavor was so strong that it overpowered the taste of the squash noodles and it tasted as any other pasta dish would. I can't use enough words to describe how simply delightful all the food was here. Thinking back, there are many other delicious items that I probably would have enjoyed- the cauliflower pizza, the black bean burger, loaded potato skins- so I know I need to make another trip back. I'm giving The Butcher's Daughter 5 toasts because... I think my post has made that obvious! Best of all, I didn't feel guilty eating the food and I didn't leave the restaurant feeling heavy or bloated. A huge win in my books! Ever since I saw a picture of Tsurutotan's giant bowls of udon on Instagram, I've been dying to come and slurp my own bowl. Although I've always felt that udon is usually served in larger bowls, Tsurutotan definitely has some of the biggest bowls I've ever seen (hence the steeper price tag). They also have an extremely extensive udon menu (4 pages! ), which provides a variety of broths that can't be found elsewhere. My biggest tip for eating here is to make a reservation before coming because its packed with people waiting and there aren't too many seats available. Also, come on an empty stomach! True to rumor, the bowls are HUGE and adding extra noodles is actually free so... never say no to free. I had to take some of my noodles and broth home because the sheer amount of food was too much for me. My friend and I considered sharing one bowl and then a smaller appetizer, but our tastes are so different we couldn't agree on just one bowl. 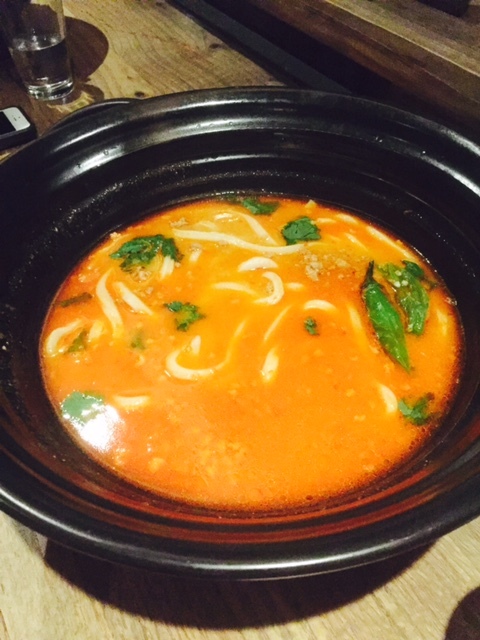 Instead, she ordered the spicy Tsurutotan udon and I ordered the creme mushroom and crab udon. The restaurant has two types of noodles, classic udon and super thin udon, for guests to choose from. Both of us stuck to the classic version since we prefer thicker noodles. Her spicy noodles weren't too spicy and my creme udon wasn't too creamy/cheesy so both bowls suited our tastes very well. The only thing was that the mushrooms in my broth were so big that I wish they had been cut into smaller pieces first before being thrown in. But other than that and the high price (although well deserved) I really loved this place and felt like Tsurutotan was really worth 5 toasts. I can't wait to come back and eat other bowls of udon on the menu! Since I'm counting down the last few days until I leave for Texas, there is no point in buying a bunch of groceries that I won't be able to finish in a few days so I've been enjoying the New York dining scene. Something that I always overlook are restaurants that are located near where I live. I have the mentality that these restaurants will always be there so if I have the time and budget to eat out that I should go further out into the city. Then before I know it, I'm moving to a new neighborhood and those restaurants are no longer there for me to try. So I've made a consicous effort these past few months to try restaurants that are convinently located near my apartment. I have to take advantage of my Hell's Kitchen location! Tonight my friend and I dined at Annabel's, a classic American restaurant. Annabel's menu is so extensive- probably one of the most extensive menus in the city (the longest menu ever goes to Shopsins though). There is something for everyone on the menu so its a great place for groups or just picky friends. Since my friend is extremely lactose intolerant and we wanted to share everything so we could taste more than one dish, we were unable to order the mac and cheese with pork rib (there's always next time!). But, we did have two awesome appetizers, the crispy shrimp tacos and the breaded calamari, which were delicious. 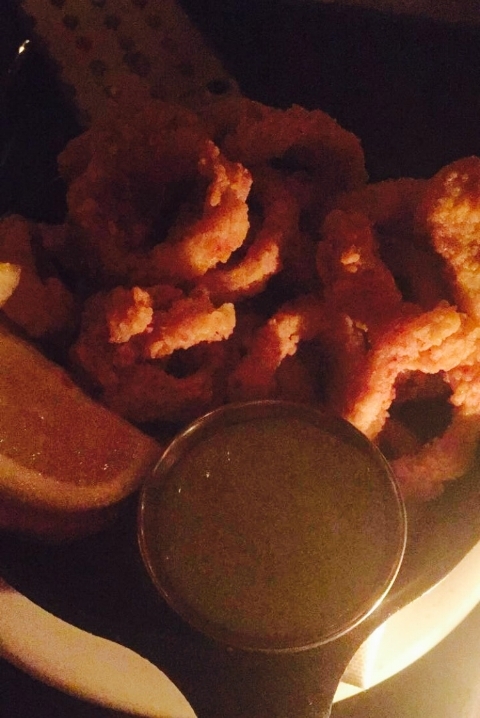 My friend and I both agreed that the calamari was out of this world amazing. They were perfectly crispy without being too oily or overly fried. 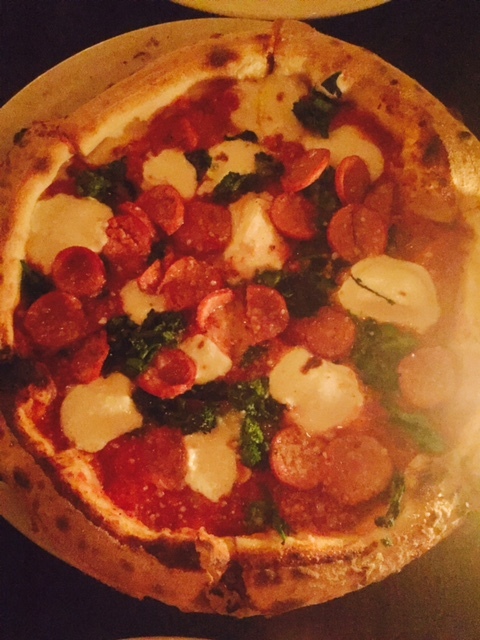 For our main dish we had the spicy sausage and broccoli rabe pizza, which turned out to be pretty good as well. The sausage was spicier than I expected, but not to the point that it overwhelmed the flavor of the pizza. I'm giving Annabel's 4.5 toasts because while everything was perfect, I do wish the menu had a bit more unique choices. However, when it comes to making classic American food, Annabel's is definitely the place to go! I've basically hit the motherload and discovered one of the best modern Chinese restaurants in the city. Now being in a large and diverse city, there are obviously several similar restaurants (Pinch Chinese, The Chinese Club, Red Egg, etc...). But I think Chaan Teng takes the cake because not only is the food flavorful and delicious (and if you haven't noticed already I love well flavored food), but its also very well priced for the Hell's Kitchen/ Midtown area. Personally, I think its a hidden gem because its located in an area where good food isn't known to be located so its constantly overlooked. The restaurant has a 1930's Shanghai era feel with its blue and white decor and Ming Dynasty inspired porcelin on display. Their menu has a variety of inventive dishes (fried cheese curds in sweet and sour sauce) as well as Chinese classics (pan fried dumplings) so it caters to a wide audience. A solid 5 toasts! We started off with the chicken pan fried dumplings ($7) based on the recommendation of the waiter (and the fact that my friend refused to order the cheese curds). There was honestly nothing special about the taste of these dumplings, but they still tasted much better than the frozen Gyoza dumplings many other Asian restaurants offer. Next time I would probably try another appetizer dish. I do like how they made the dumplings chicken based instead of the usual pork because many people don't eat pork these days. 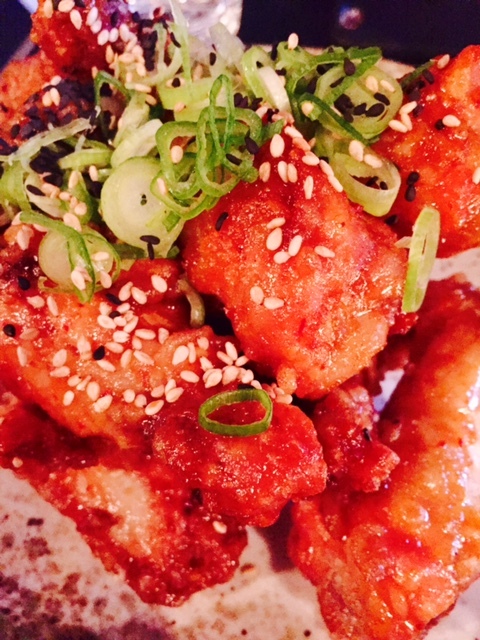 I ordered the General Tso Chicken and Waffles ($12.95), while my friend ordered the spicy noodles ($12). Her noodles reminded me of the Thai Pad See-Ew noodles, except spicier. There was lots of vegetables mixed in and the dish was quite plentiful. I really liked the freshness of the noodles and the burst of flavor that one bit offered. My chicken and waffles were on a different level though. The batter of the fried chicken was seasoned perfectly to where it was similar to the popular Taiwanese popcorn chicken bites and it was fried to the point where it wasn't too oily (a pet peeve of mine when it comes to fried chicken). The General Tso sauce was also lightly rubbed all over the chicken so it didn't effect the crispiness of the chicken, but still had enough flavor. In other words, the chicken wasn't drenched in sauce. the waffle had prunes on it and came with a light syrup on the side. Delicious! I didn't get to try any desserts this time, but it's definitely on my to eat list for my next visit! Another Saturday, another brunch. Except this time some of my friends from Texas are in town! I racked my brain (as usual) trying to decide where to take them for a meal and chose Rosemary's because its located in West Village (which in my personal opinion is the best spot for brunch due to its cuteness overload) and because the space is quite large for a NYC restaurant (we had a total of 5 people). I didn't want my friends to experience the dark side of New York brunch (aka the long wait times) and I also wanted to try a new place that I had never gone before so Rosemary's seemed to be perfect for us. Bonus- it was so beautifully decorated for the holidays! Trying the rosemary focaccia was high on my list since the restaurant has its own rooftop herb garden where it grows its own fresh herbs. Coincidentally, all 3 of us ordered the rosemary club panini, which was on pressed focaccia bread. We also shared the fried fingerling potatoes. I personally liked the panini a lot and felt like it tasted very classic. The focaccia was fluffy and the herbs made it stand out more. Plus, it wasn't stuffed to the point where the sandwich was falling apart (one of my pet peeves).The potatoes, however, were very dry and overly crispy to the point where it was kind of hard to chew. Additionally, the potatoes didn't come with any type of dipping sauce that would have potentially made the potatoes less dry. Eventually we did ask for ketchup (they did not want to give us any mayo) and after that we found the potatoes to be actually pretty decent. Although I essentially only tried two of their many dishes (and they do have a decently long menu) I feel comfortable in giving Rosemary's 3.5 toasts. 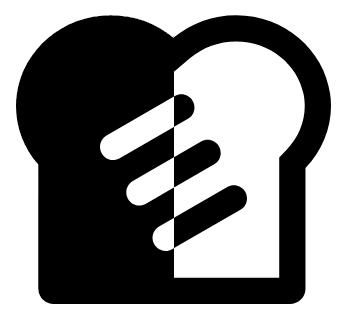 Their concept isn't to be vastly different or unique, but to just create reliable tasty food. That being said, I don't feel like that their food necessarily stood out to me in anyway. In the giant food scene that is New York, I think I would choose to try another restaurant over coming back to Rosemary's. It seems like every few days another new dessert spot is opening with the newest fad of ice cream dessert. The more elaborate or unique looking or "Instagrammable" it is, the more popular it seems to be. While not all of these ice cream trends are actually delicious, I thought I would give you a rundown on some that I've come across in New York. Even though it's extremely cold in New York right now, I've always felt that ice cream (eaten indoors) is a year round dessert. Or maybe it's just because I can't ever resist anything sweet! Chikalicious- I'm not sure who the mind behind these churro ice cream cones is, but he or she is brilliant! The churros are baked and not fried so the layers are perfectly flaky. Eggloo- Ice cream tacos in Hong Kong style egg waffles. These egg waffles were typical street snacks that I ate when I was studying abroad in Hong Kong 3 years ago and eating them now always reminds me of those fun filled days. Unlimited toppings are always a bonus too. Ice and Vice- Colored cones and very odd ice cream flavors. They have all kinds of colored and flavored cones that are quite yummy. However, their ice cream flavors were a little too unique for my tastes and I ended up having to sample all the flavors before choosing one. Taiyaki NYC- Japanese fish ice cream. Ice cream is placed inside the mouths of the fish shaped bread pastry, which also has a filling. Toppings are unlimited here as well. I love these fish pastries so this dessert was one of my favorites. Minus Celsius- Rolled ice cream. A trend that has caught on around the country and has spread like wildfire. It's fun to watch them make your rolls and even more fun adding a variety of toppings to it. KITH- Ice cream with cereal mixed in. Out of this entire list of ice cream desserts, KITH was by far my most loved. The cereal mix in is a genius idea because the flavors combined work so well together. The portions are huge here so buying one for two people to share is more than enough. Do you guys know of any other NYC ice cream dessert spots? I haven't tried Stax Ice Cream yet and it has 5 stars on Yelp so I have high hopes for it! If you haven't noticed already, I'm originally from the South and I LOVE Southern food. I don't think I could ever get tired of crispy fried chicken, mac and cheese, mashed potatoes, warm biscuits, cheesy chips and queso or nachos, and tender juicy brisket. Sadly, living on the east coast means that its not often I get to eat these things at the same quality that I would normal have back in Texas. There just aren't that many restaurants that have the same taste as good ole' Southern cooking. However, last year my friends and I (on a homesick night) decided to try the Upper West Side staple, Jacob's Pickle, and we were so surprised at how good it was! The portions were huge too, which definitely reminded us of home. I recently discovered that Jacob's Pickle has a sister restaurant, Maison Pickle, also located on the Upper West Side. So naturally I dragged my friend to try it out. Maison Pickle is a bit more upscale than Jacob's Pickle and the dishes are more refined and a smaller (although definitely still a good size). 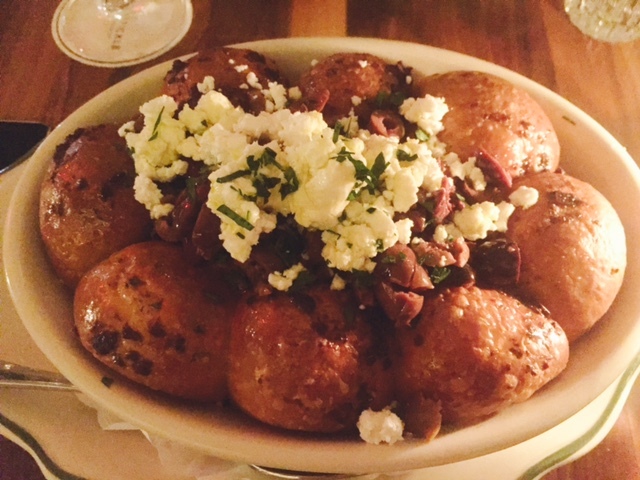 We started off our meal with this delicious pull apart bread with feta cheese, herbs, and olives. There were also options on the menu for the bread to be topped with butter or garlic, but we didn't want our breaths to stink! The bread was soooo soft and the flavors worked well together. I ordered the brunch mac and cheese (such a genius idea! ), which had sausage and jalapenos blended into it and was topped with a fried egg. I've been a lover of mac and cheese for a while now, but this was something on a while other level. The dish basically combined my love for cheese and my love for brunch and created a wonderfully made mac and cheese. I would come back and order this again in a heartbeat. Although, the restaurant does have two other types of mac and cheese available as well: classic and buffalo chicken. My friend ordered the sausage and rice dish, something usually not found at a typical Southern restaurant. But, I think this dish catered to a different type of palate, probably one that isn't needing in your face Southern food. The rice was cooked and flavored well and overall we enjoyed this more refined dish too! Both of us agreed that Maison Pickle was worth 4.5 toasts. I think lower prices would have definitely bumped it up to 5 toasts. I'm not sure Southern food is meant to be upscale and expensive? Being raised in Texas, I've always the considered Southern food atmosphere to be very welcoming and family like. My mom recently visited me in the city and I spent FOREVER deciding where to take her for meals. I've always felt like as a foodie, there is always a pressure to find the "perfect" spot to take family when they are in town. After all, most parents, especially visiting parents, have different standards than those of us in our mid-20s. I knew places too dark and too loud and with low quality food would definitely be out. Also out would be a place that had too long of a wait. While I might be fine with waiting 1-2 hours on a Saturday morning for fluffy pancakes at Clinton Street Baking Company, I knew my mom wouldn't want to waste her New York minutes on it. Plus, I also wanted to fulfill my desire of trying new restaurants. There's something special about experiencing a restaurant for the first time with someone else and trying the food together. After much research (and I mean much), I decided on the following restaurants. And they all met with her approval so I've deemed them parent safe! Upscale sushi, with an emphasis on delicious handrolls. That's how I would describe DomoDomo. While pricey, the food was very high quality and the flavors worked well together. We ordered the handroll course of 5 different hand rolls, which came with edamame. The oyster tempura, shrimp tempura, and the chocolate (yes it really did have chocolate) eel were my favorite rolls, although to be honest everything was so yummy. We also ordered the uni pasta, which turned out to be black squid ink pasta (something I've been wanting to try) drenched in a soupy cheese sauce and uni. My only complaint was that the dishes were too tiny! L'Amico is located inside the Eventi Hotel and while it is slightly loud and slightly dark, the atmosphere is still comfortable and the food is very good. I loved my veal pasta and my mom throughly enjoyed her mushroom pizza. However, our favorite part of the meal was our appetizer- the octopus. As soon as a piece of the octopus entered my mouth the flavors bursted into pepper, lemon, and so many other things that I couldn't place, but the combination was DELICIOUS. I didn't plan to eat here with my mom, but we were short on time and this Korean restaurant didn't have a wait so we decided to grab a quick dinner here. I've actually been here before and didn't feel like the food necessarily stood out, but this time around I truly enjoyed eating the spicy octopus rice dish. Although slightly too spicy (you guys know I have a weak stomach when it comes to spicy food), it was still something I would reorder. No New York experience is complete without brunch so I knew I had to bring my mom to a classic brunch spot in the city. And it doesn't get any more classic than the bright rustic restaurant, Bubby's, located near the High Line. The fact that the food was mouth watering was a bonus! Their pancakes rival those from Clinton Street and their pie was unlike any other pie I've had. I'm so ready to come back for their dinner menu. While reservations can't be made here, we came early on Saturday morning and didn't have any trouble getting a table immediately. I didn't actually eat here with my mom because she had an early Sunday morning flight, but since I was already up that day I decided to join a few friends for brunch at this adorable Australian cafe. There was a 30 minute wait (which isn't too bad considering it's New York), but they text you when your table is ready so you're able to walk around the neighborhood while you wait. I ordered the chai latte and the pulled pork sandwich with sweet potato fries and spicy mayo. The spicy mayo was amazing and I don't say that often! I also appreciated that the burger wasn't too big to fit into my mouth in a bite. Does anyone have issues when a burger is so tall that you have to eat it piece by piece? For some reason, that really bothers me! Luckily, I didn't have that issue at Banter. Where do you take your parents when they visit? I'm always looking for new suggestions! Blogmas Day 2- Trying Caribbean Food for the First Time! Since I haven't been doing a lot of traveling in recent months due to New York commitments I've started to feel a little bummed out that I'm not able to explore a new country or try out new experiences. So when my friend suggested I try out a different country's cuisine that I've never tried before I thought it was a brilliant idea. After all, I call NYC home and its the culture capital of the US! There are so many different types of legitimate cuisines based right near me that I can experience without even having to hop on a plane. After some research, I decided to try Caribbean food at the famed Soho restaurant, Miss Lily's. 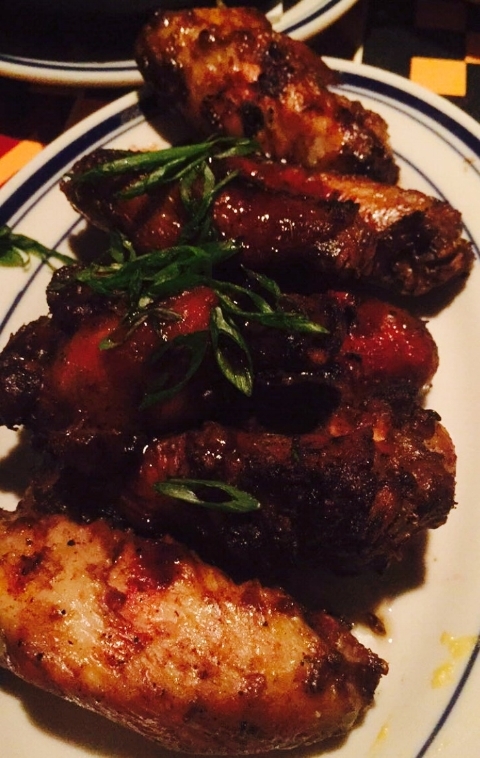 Miss Lily's menu offers a variety of jerk meat (chicken, pork, salmon), several entrees including a Guyanese option, and a plethora of delicious sides. I went with a friend who is actually from the Caribbean so she would be able to recommend items off the menu and tell me whether or not the food was an accurate reflection of what the country's food is like. We were so excited to try everything on the menu that we each ordered the jerk chicken wings plus two sides each (mac and cheese pie, jerk fries, rice and beans, sweet plantains). This ended up being way too much food for us (I'll be eating leftovers for two more meals! ), but we were able eat a good variety of the restaurant's offerings. We also shared a yummy drink called sorrel and a coconut rum cake dessert. My friend gave her stamp of approval on the jerk chicken that it was what typical jerk chicken in the Caribbean would taste like. Although, the chicken ended up being a little too spicy for me (I'm a wimp...) it was still a positive experience. My favorite thing was definitely the macaroni and cheese pie. This was one of the best mac and cheeses that I've ever had- it wasn't overly oily and gooey and had a nice crunchy outer layer. The jerk fries were nothing special (just normal fries with minimal jerk flavor and I probably would not order this again. Have you guys ever tried Caribbean food before? Gnocchi is definitely one of the weirdest words in the dictionary to me. It's also so hard to pronounce correctly! But it represents one of the most delicious pastas out there. Little balls of potato and flour drenched in flavorful sauce- yum! New York recently welcomed its first restaurant dedicated to gnocchi- Gnoccheria. Gnoccheria is owned by the same owners as the wildly successful pizza place, Luzzo's (which I have sadly not tried yet). While they do have other pastas on the menu, Gnoccheria's most famous dishes is their namesake. They offer 3 different types of gnocchi, plus two different types of stuffed gnocchi, and over 10 different styles of sauce. It's enough to make any girl SUPER excited for dinner! I rated Gnoccheria 4 toasts. I"m probably getting gasps of shock from every person that has eaten at Gnoccheria and comments that it should be 5 toasts, not 4. There's no argument that the food here is beyond mouthwatering, but the main reason why I deducted a toast is because the restaurant only fills up its tables through advanced reservations and doesn't leave any tables open for walk ins. What is the point of having yummy food if no one can eat it? Or if people have to wait for weeks/months just to get a table? I understand the point of only reserved tables if its fine dining because you want the more upscale exclusive atmosphere, but Gnoccheria is very casual so there is no reason why it can't leave a few tables open for walk in diners so everyone can en joy their wonderful food. My friends and I were lucky because while we did not make a reservation, we arrived just as it opened at 5pm and we promised to finish eating within an hour so that the table could free up for a 6pm reservation. This turned out to be no problem for us because we were starving and the gnocchi was so good that we actually finished our meal within 30 minutes. Before I speak about the actual food, I want to preface by saying that I LOVE options when it comes to food. I loved getting to "create" my own dish by mixing and matching the gnocchi options with the sauce options. It allowed me to pinpoint exactly what I wanted to eat. That being said, because of all the different options I was obviously unable to try different types of combinations for the purposes of this review. I ordered the spinach gnocchi with salmon and asparagus cream and my friends ordered the stuffed mushroom gnocchi with carbonara and the purple potato gnocchi with four cheese. Personally, I felt like my spinach with salmon and asparagus tasted the best because it was the right balance of flavors. There were tiny bits of salmon and asparagus in the cream sauce, which added to the variation of flavor. But there wasn't giant pieces of both, which would have overwhelmed the dish. Plus, the sauce wasn't overly cheesy or creamy which can be a turn off for me (and my slightly lactose intolerant stomach). I really liked chewing the gnocchi, although I couldn't really pick out the spinach flavor. The good thing about gnocchi is that its not messy to eat, unlike spaghetti or fettuccine, so it is a safe date option. The patio is super cute and we all enjoyed sitting outside in the breeze with our food. 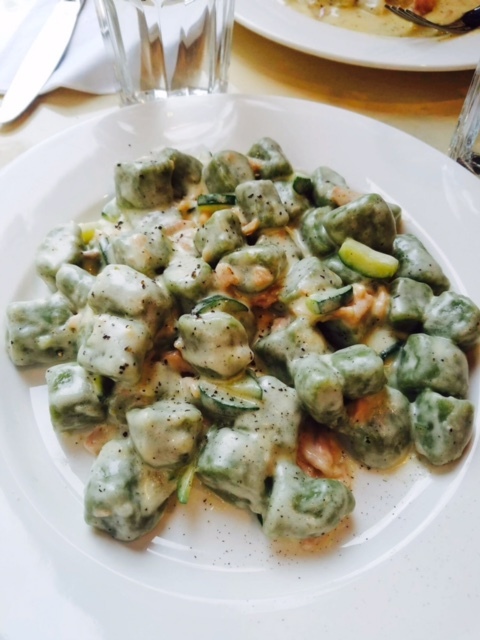 I can't wait to go back to Gnoccheria and try a totally different combination of gnocchi and sauce! That's probably one of the best perks of this restaurant! I never knew how big brunch was until I moved to New York. Here brunch is LIFE. There are so many amazing brunch spots in the city that I'll probably never even come close to being able to try them all. Although, in my two years as a New Yorker I've definitely put a dent in the brunch market. Now whenever my friends or family come to visit me one item on my must do list is taking them to eat brunch. One of my sorority sisters and her husband came down from upstate New York this past weekend for a break from their busy lives as doctors so we decided to hit up a bunch of cute West Village eateries (mainly because we couldn't just choose one). Originally, I had a huge long list of places to eat at, but after 3 spots we became too stuffed to continue... Definitely one of the downsides to having a small stomach, but big eyes! Before eating desserts, I usually need something savory to start my appetite so we dropped by the popular High Street on Hudson cafe for a quick bite. To our delight, the wait was only 25 minutes! While that may seem like a long time to somewhere from anywhere else in the States, for New York brunch time it is considered to be a short wait. I've waited up to two hours (Clinton Street Baking Company) for delicious brunch before- like I said, us New Yorkers are crazy about our brunch. At High Street, my friend and I both ordered The Forager- a burger with no meant, but plenty of kale, mushroom, and egg. Along with my passion fruit tea, it was the perfect start to my day. During our 25 minute wait for brunch, we didn't want to just sit around so we headed to Aux Merveilleux De Fred to try the highly rated Merveilleux cakes. These tiny cakes were created in France by the pastry chef, Frederic Vancamps, to be light little cakes. We chose the double chocolate and the speculous flavors and while the consistency wasn't what I was expecting, it was very interesting to taste. After brunch, we stopped by Dominique Ansel Kitchen for a post meal dessert (I do love my sweets). This is the sister outpost to the famous cronut bakery, Dominique Ansel Bakery. The Kitchen version has a more extensive menu, including sandwiches, and doesn't have the crazy long lines and influx of tourists. A good alternative for the crowd averse person! Plus, they still serve much of the same desserts, including their staple pastry, the DKA. My DKA actually had ICE CREAM in it. Whoever though of the combination is genius- and probably my favorite person! The DKA is a sweet flaky doughy pastry (similar to a croissant) and mixed with vanilla ice cream, was delicious. Also, excuse my shirt... I realized at the end that it was literally messed up in every photo I took because it was so flowy that it kept moving around (and for some reason no one told me!). So the next place isn't brunch, but we became too tired from all the eating in the morning and had to take a break. For dinner, we ate at the ramen hot spot, Ippudo. Ippudo is another one of those restaurants that always has a long line so waiting is a guaranteed thing. For our table of 7, the total wait time was 2 hours! Since I come to Ippudo for their ramen quite a lot, I decided to try something else this time around and went for their ramen okinomiyaki. Okinomiyaki is a Japanese dish that is basically a thick pancake with meat and vegetables mixed in and mayo and bonito flakes and sauce on top. Ippudo goes the extra mile with the dish and adds in their ramen and wagyu beef. I've had a lot of okinomiyaki over the years (its one of my favorite Japanese dishes), but Ippudo's version definitely is the winner. The flavors all aligned perfectly. Also worth noting is my drink. I had no idea what I was ordering but I got some kind of pink sparkling champagne sake mixed drink that had jelly in it. An odd combination, but somehow it all came together to make the girliest drink ever- I loved it! Mah Ze Dahr Bakery- I actually came here a week later and ate a yummy coffee cake. Its a very cute and clean cut place. Have you guys eaten at any of these spots? Do you guys prefer dessert or more savory food? I love David Chang and his entire chain of momofuku restaurants. I just wish I had unlimited funds to be able to eat at all of them! Ma Peche is actually a decently priced restaurant, with a mouth watering breakfast, brunch, lunch, and dinner menu. Plus, its reservation system isn't always booked up (always a bonus in New York). It's located inside in the Chambers Hotel in Midtown so I was even able to walk there from my Hells Kitchen apartment (in an attempt to get some exercise before eating fried chicken of course). By the way, two of David Chang's other momofuku restaurants are also based inside the hotel- Fuku+ and Milk Bar. I'm rating Ma Peche 5 toasts because every dish was just so flavorful and I love well flavored food. Because there was just the two of us eating brunch, we were only able to order two dishes (I'm a strong proponent against wasting food and I typically don't like to over order) so I didn't get to try many other menu items, which means I'll definitely be back. 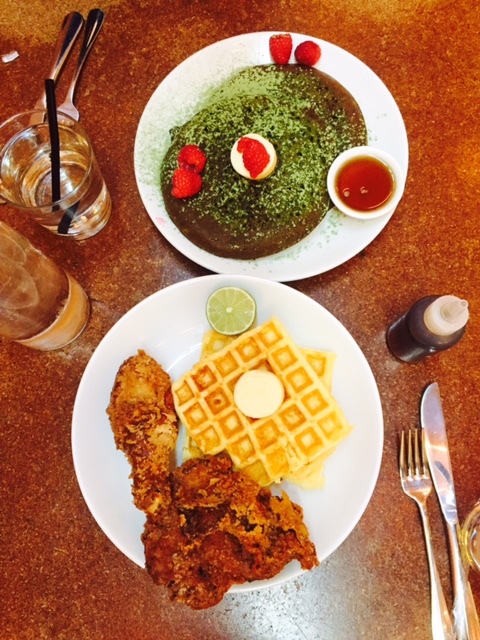 We ordered the matcha lavender pancakes and the habanero chicken and waffles. The fluffy pancakes were HUGE and there were two of them. There was a side of lavender flavored syrup ready for pouring, which wasn't overly sugary. If you like matcha, I would strongly recommend this dish to you as it reflects the matcha flavor very well. If matcha is already not your thing, I wouldn't order these pancakes as I do feel like matcha is an acquired taste for some people. 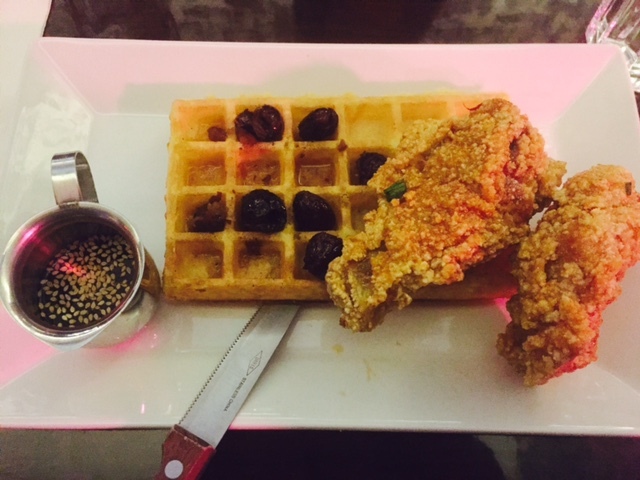 Instead, order the chicken and waffles! They were slightly spicy, but not enough that your mouth will be burning up and uncomfortable while eating. It was spiced just enough to add that little kick to the fried chicken. I'm not sure what the waffles were made out of, but they were so DELICIOUS. The chicken and waffles were a solid brunch choice and the portions were again pretty big. Next time I eat here for brunch (and I will be back) I want to try the salmon toast and the kimchi burger. What about you guys? Have you guys eaten at Ma Peche before? It seems like the next big thing these days is fusion food, which I love because then the flavors and dishes of one cuisine is combined with another cuisine to produce something unbelievably different. When I first heard that Korean American chef, Esther Choi, would be opening a second restaurant in New York, I knew I had to try it. I'm always a supporter of Asian talent, but also Esther's first restaurant, mokbar, has some of the most delicious kimichi fries ever. Ms. Yoo, however, takes on my of a tapas approach where the key is to come with friends and order many smaller dishes. I am rating Ms. Yoo only 2.5 toasts for the reasons below. Her dishes were not as packed with flavor as I would have liked. Although my friend and I loved the cheese tteukbokki, but the Korean chicken wings and the squid fries did not suit our tastes. The chicken wings were nothing special and we felt like we could have just gone to Koreatown for Bonchon or Olive Chicken instead for better tasting wings. Also, we originally thought that the squid fries would be like calamari fries, but they turned out to be thin strings of dried squid that was then fried. Both these dishes were disappointing to us since we felt like there was so much potential for them. The cheese tteukbokki, on the other hand, was delicious and one of the main reasons this restaurant was not rated two toasts. There was bacon and mushrooms spread out among the cheese and the cheese was SO cheesy (just the way we like it). The portion was the right size as well- not too small where we felt like we weren't getting our money's worth, but not too big to where the taste would be overwhelming. We also received the nori popcorn for free while we were waiting for our food to arrive and the popcorn had a weird taste in my opinion. There were strands of seaweed mixed with the popcorn, but it didn't provide much in the way of flavor so overall the popcorn was bland. Another reason why Ms. Yoo disappointed us was that the waiters did not know much about the food or Korean culture. Some of the dishes were mispronounced by the staff and the waiter did not even know what type of sauce he was serving us with the fried squid. This could be because the restaurant was new, but I still feel like the staff could have been better prepared to welcome curious diners. One major redeeming factor of Ms. Yoo was that if you dine there during happy hour (Monday to Friday from 5 to 7pm), the entire menu (besides their whole chicken) is actually half off. So our bill ended up being only $20 for two people, which is a pretty decent price for a Korean dinner and unheard of in the city. If you feel the urge to try Ms. Yoo, I would definitely suggest coming during this time. Otherwise, the meal may not be worth your money. I recently discovered the best Japanese food in Manhattan and just had to share with y'all. Surprisingly, it was located in Midtown West, which is usually a vast space of touristy overpriced mediocre food. Sake Bar Hagi was actually kind of hard to find as the sign wasn't too clear and its located next to two other similarly named Japanese restaurants. After much searching, we finally made it to food heaven. My friend and I decided to order several dishes tapas style so we would be able to try a bigger variety. BEST DECISION EVER. I'm giving 5 toasts on my rating scale because the food is such good quality, authentic, and decent portion size for its pricing. We started off with the yakitori set. Personally, I don't like green peppers so I didn't try that (they didn't let us substitute it out either). The chicken meatballs were my favorite. Then we moved on to the creamy (but spicy) mentai pasta with cod roe. This was by far my favorite dish and the next time I come here I would order this again in a heartbeat. Next, the tasty and thick okinomiyaki! I loved this as well and thought it was one of the better made okinomiyakis I have had in New York. Mine had pork in it, but there is also an option to add seafood as well. And then more spicy mentai cod roe, but this time with rice. The taste and spice level of this rice dish was similar to the pasta dish above, but the pasta dish definitely excelled at it better so I don't think I would order this again. Last but not least, was our dessert! Our baked pastry fish was stuffed with red bean and came with matching red bean ice cream. The fish was baked so it was the right amount of hot and crunchy. If you are ever in the NYC area, I strongly recommend this restaurant. Usually I'm hesitate to push for a specific restaurant to people because everyone has different desires and tastes when it comes to food. However, I feel like Sake Bar Hagi has a large enough menu that there is something yummy for everyone. Literally, their menu is a book. The best part, in my opinion, is that the portions are pretty good for its price. At some competing Japanese tapas restaurants, you will find yourself ordering similarly priced food items for a much smaller portion. Do you guys like Japanese food? Which dish was your favorite?